Soil- you can grow that! 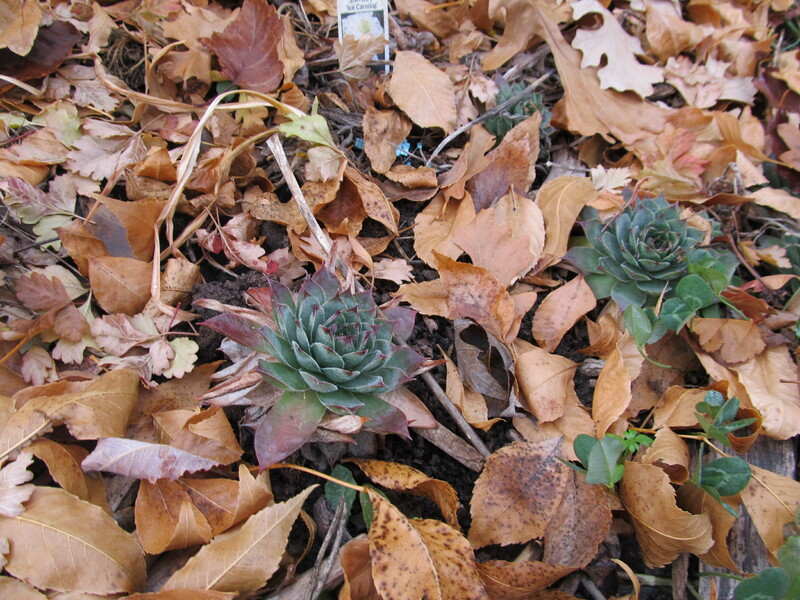 Hens and chicks in leaf litter. Here on the front range of the Rocky Mountains, we have alkaline clay soil that ranges from tan to brown in color. I can jump up and down on the blade of a shovel and not make a dent. I use a thrift store knife to cut weeds off at the root, and I have broken two- snapped the blade clean off in the hard soil. Except in places where I have mulched. In shrub beds around the yard where I have been piling leaves and wood chips, I can slice into the soil like it was chocolate cake. Well, maybe brownies. The best explanation for what happens when we add organic matter to soil that I have read is from Mel Bartholomew’s Square Foot Gardening. Imagine sandy soil is a jar of marbles, water just pours through, moistening the marbles, but not staying in the gaps. Organic matter works like little sponges in between the marbles, holding onto the water and nutrients. Imagine clay soil is like a pile pf playing cards. Water sits on top in a puddle, slowly sinking in. Organic matter works like little sponges in between the cards, creating space for water and air. 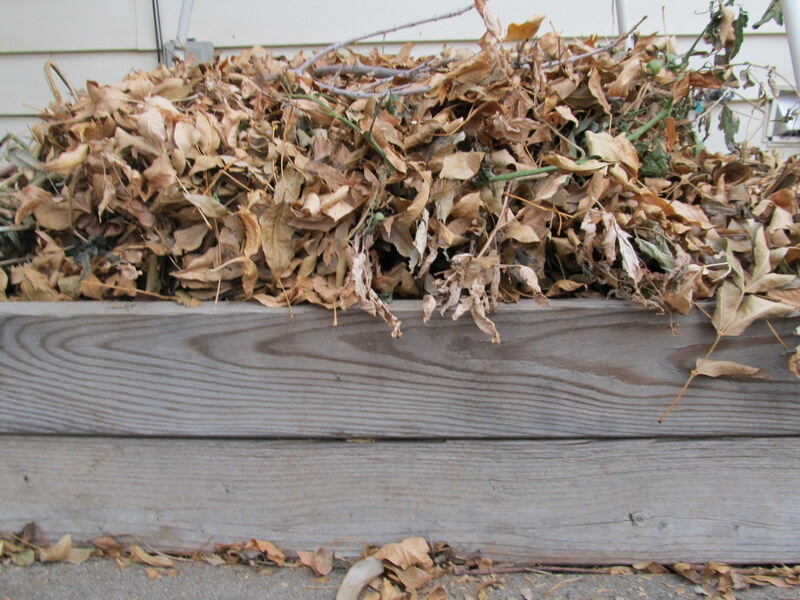 Compost– My favorite compost bin is one that has no bottom, and can be moved around the yard. Every six months or so, I put my bin under another tree, or next to a bush, and when I dump out coffee grounds and orange peels, I enrich the soil in that space. When the bin is full, I move it to a new location, spread out the pile, and have automatic mulch in that zone. Leaves– I have two big ash trees- they drop copious leaves which I sweep off the patio and rake onto my asparagus, and raspberries, and strawberries, and veggie beds. You may not live in a neighborhood with big trees- some cities have leaf exchange sites where people who don’t want leaves can get rid of them. A few years ago, I participated, and a man brought over a flat bed trailer with a mix of leaves and fresh cut grass. It was heating up as we unloaded the trailer and I spread it around. It made lovely mulch. Wood chips– I get a pick-up load of wood chips pretty much every year. The goal is mostly to keep weeds down and hold moisture in the soil, but they slowly break down to build soil as well. A mix of autumn leaves and dead tomato plants, with some sticks on top so it won’t blow away. By spring, it will all boil down to the level of the top of the raised bed. – I am lazy about “putting the garden to bed” because I know that the stems and leaves of the plants themselves will break down into soil. Weeds with seed heads I usually throw away, although I don’t get all of them. I intentionally leave some seed heads, like for coneflower or sunflowers, for the birds to eat. Tall stems also catch blowing snow and leaves around them so they act as tiny snow fences. So, whether you have sandy soil or clay, your garden can benefit from adding organic matter to it. This is a great time of year to begin a garden- pile up leaves and let the worms and other critters turn them into soil for next spring. Rabbit Hole Warning: See CL Fornari’s You Can Grow that site for more ideas of what you can do, no matter where you live. I love your idea of posting about growing soil. After all, without it there would be no plants to write about for You Can Grow That! Your advice is spot on … mulch, compost. Just think of the productivity so many gardens would have if their caretakers only followed these two steps. I am rabid and avid about building good soil, too. My neighbor and I brought in yards and yards of 4 way commercial soil and mushroom compost, but it wouldn’t clump or drain properly. That’s when we went to her aged chicken manure and my nice compost bin filled with obliging productive red wigglers. It’s made all the difference in my productivity. Bet you get volunteer tomatoes and squash every summer. Also, do you find that the slugs hide under the leaves in the winter? Thanks for an informative, interesting post. Possibly because it is so dry here, I don’t have too many problems with slugs. The only thing they really go after is my strawberries. I think slugs eat only fresh green leaves, so dry leaves wouldn’t hold much interest for them, anyway. I bet the red wigglers and chicken manure really did make a difference- all that soil life probably brought the mushroom compost back to life! I can recommend a worm composter as well. It will take care of all your cooked food, creates nice compost and compost tea. It is especially great for small gardens. Same as you we have sticky clay here which is a pain in the … to dig in. We have dug deep beds and put horse poo on it ( which I get with a wheel barrow from ours and our neighbors land.). My vegetables have been a lot bigger since I started doing that. I am curious about your answer to Benita, this year we have had so many slugs, they hide in the grass sides of the beds so I can imagine they would love the leaves. When we rented, I had a worm composter that got infested with fruit flies. I gave it up, and wound up letting my worms be “free range” instead. A thought about your slug problem- did you set out beer traps? And also, if you can attract garter snakes, they will prey on the slugs. I know for a lot of people, they would rather have slugs than snakes, but it’s a way to balance things…. They just need cover to slither around in, rocks to bask on. GREAT POST! Healthy soil is the foundation of any healthy plant. The amazing microbial things that happen in the soil! Did you know that injust one cubic inch of healthy forest soil there are over 2 billion micro-organisms? you’re a person after my own heart- most people roll their eyes when I talk about all the microbes in my soil! Although I live in a completely different part of the country, alkaline clay is also my problem. We also have very little organic matter, so compost not only helps enrich our soil, but it make life much easier than having to haul away all the end-of-the-season material wastefully into the dump. I love compost!